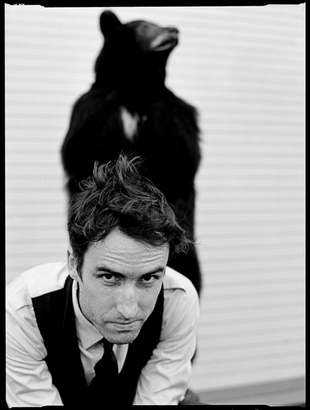 Andrew Bird is evolving. He still whistles mellifluously, and his violin continues to be his alter ego, the magic cloak that dissolves his shyness. His lyrics are just as grandiloquent as ever, and his loops are still wrapping around audiences, pulling them into his onstage multi-instrumental—violin, guitar, mandolin and glockenspiel—spectacle. But Bird, the Chicago-born, -raised and -made artist who has particularly avoided categorization, someone who wishes his music wasn’t labeled “indie rock” but usually is, continues his evolution with “Noble Beast,” his latest record, released last month in conjunction with an instrumental album. That deal was when he got a surprise record contract from Rykodisc. He formed a band, Andrew Bird’s Bowl of Fire, and they recorded “Thrills” in New Orleans in 1997. The band went on to release two more albums, laden with folk, jazz and swing influences. This was just the start of what would be almost a decade of struggling as an artist, trying to sell small shows, records and an audience. Sitting at Francesca’s Forno on a December evening with a blizzard forecasted to arrive any moment, Bird’s just come from painting the walls of his Bucktown apartment in bold colors, he says. It's time to relax—both here and at his farm in Elizabeth, Ill.—before his own storm, the release of the album and subsequent tour. It had been just announced that he’d headline the Hideout’s inaugural concert in D.C., a sort of kick-off for his own tour, with a drummer, guitarist and bass player. Bird, a musician who's thrived on being fringe, who still enjoys biking around town putting up his own posters, is poised to become what he’s both sought and fought—incredibly popular. His third and current label, Fat Possum, expects this, his eighth studio album, recorded in Nashville and at the Wilco Loft in Chicago, to be the one to make him an unequivocal star, and they’ve thrown unprecedented promotional support behind it. In September, 13,000 people showed up for his Millennium Park concert, rushing the stage in an after-concert frenzy, and his upcoming April show at the Civic Opera House sold out within a couple of hours (they then added a second show). But Bird watchers aren’t gazing upward only in Chicago. Performing more than 200 concerts a year across the globe, he just played a sold out show at Carnegie Hall. In fact, he’s selling out everywhere. Bird, tall, slim and dressed in jeans and a sweater over a button-down, with a wave of brown hair falling in the middle of his forehead, eyes dark and deep set, is thoughtful and soft-spoken, although as he gets more comfortable, his speaking voice becomes soulful. He’s shy and makes no effort to cover it. “I feel very comfortable onstage and very uncomfortable offstage, mostly,” he says. It’s performing that clearly drives him. His parents tell him that at three and four he’d perform for elevators full of people, singing Christmas carols in July. It’s the same boy who would become painfully shy in public school, but would be able to get up in front of the class and effortlessly give a book report. Bird says he makes records today so he has an excuse to be onstage and play shows. In the time he says he spends alone and in the themes he brings up repeatedly, it’s evident that Bird is pensively buried in his thoughts, in the often-paradoxical world of the artist. As more of the world listens to his music, he frets about being too loyal to his own ideas and to what he's done, worried about falling into a pattern. Bird mentions “loyalty” a lot in reference to his work, as in avoiding it. He discusses the struggle in making the right things “precious.” Most of his friends (along with his mother) are print artists—Audrey Niffenegger, Chris Ware, Jay Ryan—and he admires their ability to let go, to not be too loyal to each print. He scrapped two recordings of his album “The Mysterious Production of Eggs” before the third was a charm. Lately the meticulous Bird been going back to old songs he wrote and changing lines that bother him. The song “Headsoak” from “The Swimming Hour” has “a couple regrettable lines,” he says. He struggles between taking his time and being fussy about lyrics and working fast and not trying too hard. The natural world reigns as a centerpiece in most of his work, and the melodic whistling and last name serve to tightly anchor that, so much so that one wonders, was he really born a “Bird”? He was. Growing up in Lake Bluff, the second youngest of four children, Bird remembers wandering through ravines with a Sherlock Holmes magnifying glass, “throwing myself on a pile of decaying matter, going inside there, pretending that I was microscopic.” While never interested in nature in an academic way, he embraced its passageway into a fantasy world. Bird learned how to loop several years ago—when he had more free time—out at his farm. Looping is basically overdubbing live on top of music, building layer upon layer. He says he likes that it’s quick, neither killing the inspiration nor making him self-conscious, and that to make a new idea, he has to erase the old one. He describes the loop as a “sound sculpture,” a “block of sound I can visualize between me and the audience,” adding notes where they’re needed. He usually starts with a pizzicato pattern, with its rhythmic shape. When Bird’s back home in Chicago, he likes to bike around town, just “running errands,” visiting friends, meeting with local artisans, like Ian Schneller, who makes his Victrola-like speakers. “Some of the more satisfying things I’ve done over 12, 13 years in the city is just riding around on my bike, taking care of business,” he says, smiling after emphasizing the latter part. Some of that business is designing the record covers, which he says is “hugely” important to him. The visual side of his music, from posters to record covers, “saved me and continues to save me from being so focused on music that I lose perspective.” For a limited edition of “Noble Beast,” he worked with Chicago artist Diana Sudyka to create illustrations for each song, something that reminds him of a Shel Silverstein book.